The Dirty Dozen and the Clean 15 – The what? 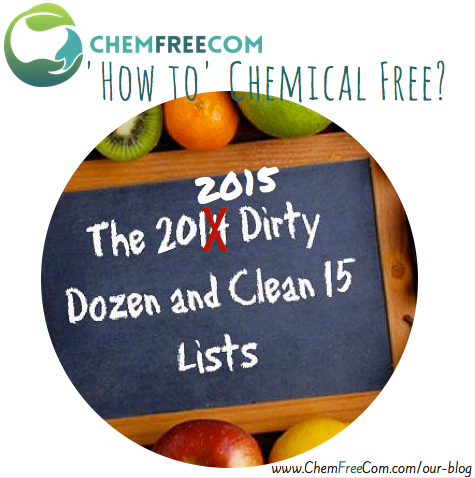 What is the ‘Dirty Dozen and the Clean Fifteen’? A Clint Eastwood movie, motor mechanic jargon, a measure of the foods we eat or a new range of laundry powder? Why is it important for me to know? What is the Dirty Dozen and Clean 15? When we think of conventional fruits and vegetables, we know that some carry a greater risk of contamination from pesticides than others. As such, there are a list of fruits and vegetables that we should always try and buy organically or spray free, and there are a list that we know generally don’t carry a high degree of toxins even from conventional sources. 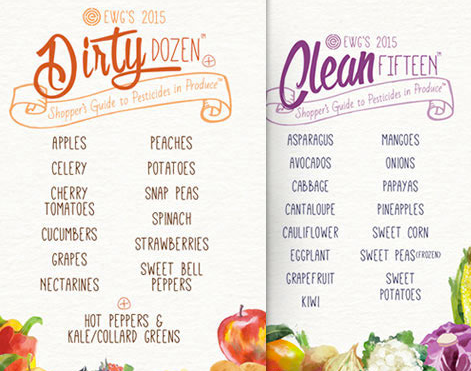 Therefore – the dirty dozen and the clean 15 refer respectively to the fruits and vegetables that are the most and least contaminated by pesticide use, according to the Environmental Working Group. Is there such a big difference? The fruit and vegetables on the Clean 15 list require minimal intervention in order to flourish, and in their non-organic (conventional farming) form contain the least amount of pesticides or nasties. Foods such as: asparagus, avocado, cabbage, rockmelon, kiwifruit, eggplant, mushroom, grapefruit, onion, mango, peas, watermelon, sweet potato, corn and pineapple. These are the safest of the foods to buy from the conventional supermarket. On the other hand, the Dirty Dozen fruit and vegetables are often laden with pesticides and other chemicals when grown. Such as apples, capsicum, blueberries, celery, grapes, cucumber, lettuce, nectarines, peaches, potatoes, strawberries and spinach. The preference is to buy these foods from organic growers. Refer to the EWG for updates to this list. Pesticides are toxic by design and if we can avoid them through eating organically, that is great. Different pesticides have been linked to a variety of health problems, including hormone disruption, cancer and brain toxicity. By understanding which fruits and vegetables are likely to contain the highest level of pesticides, and starting our organic journey by switching to these from organic sources, is a great first step towards reducing toxins from food. What do you mean by the “organic journey”? For most people, switching to organic produce is a gradual process. Because organic foods tend to be more expensive than their conventional alternatives, making the initial choices that have the biggest impact without replacing everything will minimize pesticide consumption while keeping the budget in check! Therefore starting with purchasing the items on the Dirty Dozen organically or spray free – may be the best place to start. So where should we buy these fruits and vegetables? When it comes to buying organic, check out your local supermarket as it is becoming popular for them to stock some organic options. Although this may be convenient always check labels and do your homework on the producer/grower. You really can’t beat your local farmers’ markets or buying directly from the farm for value for money. There is a great push now to “know your farmer” and in doing so, learn more about how they produce their crop and what they use. Going to a Farmer’s Market or doing a drive by all the organic farms with ‘farm gates’ (roadside stalls) can be a great day out for the family and can be an education process for the kids. Let them find and choose the fruit and vegies they want to buy. They may even eat them. An online global community with a directory for info, food, services, products and events that are either certified organic, organic, spray free, low toxic, non-toxic or chemical free. Their goal is to make it easy for families to find information, products & services that will help reduce their toxic exposure while helping grow Chemical Free businesses.